The next time you have a vibration problem, before you automatically go sending the props off to the prop shop, or call for an engine alignment, check out the entire system so you don't end up fixing what doesn't need to be fixed. Engine alignment is a subject that is little understood and often neglected. Most boat owners aren't even aware that engine alignment is one of those things that requires occasional maintenance, and is one of the last things to be considered when some kind of drive system problem develops. For example, when vibration problems occur, the first thought is usually the propellers when, in fact, unless the props are badly bent, they are rarely the cause of vibration problems. More often than not, the source of the problem lies elsewhere. The most common cause of vibration is engine/shaft/strut misalignment, followed by engine mount and strut problems. Misaligned strut galls shaft, requiring shaft replacement. Causes stuffing boxes to wear out and leak, not infrequently sinking the boat. Drive system vibration that can damage transmissions, engine mounts and the boat hull itself. Vibration causes damage to other systems. Transmission failure caused by increased stress on the rear output shaft bearings and gears. 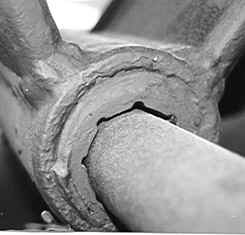 Loosening of struts, causing leaking and possible sinking. 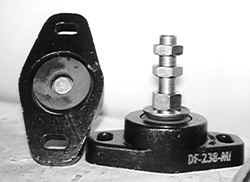 Oscillating propeller shaft causing stuffing box clamps to loosen and work free, flooding or sinking the boat. Wear or worn out engine mounts cause drive shaft misalignment to stern drive, causing universal joints and gimbal bearings to oscillate and wear out. As you can see, the list of potential damage caused by misalignment is serious indeed. The good news is that drive systems tolerate a lot of abuse and are very forgiving. The bad news is that a lack of general understanding of these systems often translates into more abuse than the systems can withstand. This shaft is badly misaligned in the bearing. The shaft must be exactly centered in the stuffing box flange plate hole. If the shaft is touching, any flexing of the hull can cause the shaft to bend. The Nature of Inboard Drive Systems It is a common belief that engines and shaft couplings have to be aligned to tolerances of a few thousandths. There is some misunderstanding about this. Yes, the shaft coupling to transmission coupling needs to fit within several thousandths, but what were talking here is the coupling fit, not the shaft alignment. This is an important distinction that is often confused. I'll explain why. A conventional shafting system is essentially a free-floating, semi self-aligning system. How's that? Well, because the engine is mounted on rubber mounts, and the shaft is mounted in rubber bearings. Of course rubber being soft, that means that both the engine and shaft can and do move. See my point here? Since neither the shaft nor the engine is held rigidly in place, there's not much point in attempting to perfectly align the shaft with the engine, is there? No, because if everything is approximately aligned, the shaft will tend to self-center as a result of centrifugal force. The fact is that conventional shafting systems will tolerate a great deal of intolerance because of these factors. The truth is that it is virtually impossible to correctly align engine and shaft with the methods that are commonly used. Because of the rubber mounts, the engine will not be in the same position when running as it is when stopped, when the alignment is made. Propeller thrust and engine torque will cause the engine to change position. And since the weight of the shaft sitting on rubber cutless bearings causes the rubber to compress, the shaft is not in alignment with the bearings anyway. When the boat is running and the propeller spinning, the shaft will align itself (but not if the basic alignment is out). The last influencing factor stems from the reality that boat hulls themselves are rarely ever completely rigid; bottoms flex and hulls change shape. After all, they are plastic and they're not supposed to be completely rigid. Even if the engine stringers are completely rigid (which they usually aren't) the shaft goes through the bottom of the hull, which flexes, and most likely the point where the struts are mounted does to. The end result is that the entire drive train on the average boat moves around a lot, often in tolerances as great as =/- 1/4" for a total movement as much as 1/2" !!! So now you see why when you pay all that money to a guy with a feeler gauge trying to make an alignment within a few thousandths of an inch is a waste of time. It can't be done. Add to this the factor of the boat hull not being rigid and its not hard to see the futility of it all. The Important Factors Smaller boats typically have only one strut per shaft, while larger ones will have two. Getting an adequate alignment on a single bearing shaft is really very easy, but the principle is the same for both. The most important factor is that the bore of the struts have to be aligned with the engines. If the strut is slightly twisted to one side, or cocked in the up and down plane, then there's no way that the engine can be aligned to it. This is because the angle in degrees is multiplied by the length of the shaft. Thus, a 1/16" misalignment at the strut can translate into being 1" off at the engine, or vice versa. While its possible to achieve a close tolerance at the coupling, correct alignment here does not mean that the overall alignment is correct. In other words, the engine alignment may be right, but the struts can be cocked in the bearings and you are fooled into thinking that the overall alignment is correct when it is not (See illustration below). But that's not all. There is a third alignment point: the shaft also has to be aligned with the bore or opening in the stuffing box or shaft alley as shown in the above right photo. This is the opening where the shaft exits the hull. Typically there is about 1/4' total clearance here (1/8" all around). 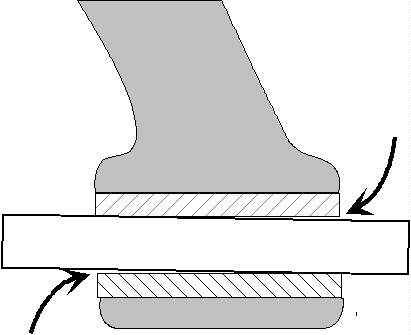 If the shaft is not correctly aligned with this opening, as it often isn't, it may mean the shaft is in contact with this flange, often to such a degree that it is bending the shaft. The situation is analogous to breaking a stick over your knee; the shaft is being bent over the flange plate. Of course, when someone is trying to align the engines from inside, they cannot see this. This is why attempts to align the engines can end up causing more problems than it solves. Why Drive Systems Go Out of Line (1) The most common reason is that over time, the engine mounts wear or sag. Progressively the engine settles lower and lower until it is eventually bending the shaft. (2) Hull changes shape. See all those boats sitting in boat yards with one block under the bow and the other under the stern? Supported at only the ends, would you suppose that the hull is sagging just a bit? Sure it is, and that's throwing the system out of alignment. (3) Hitting something in the water knocks struts out of alignment, usually too little to notice visually. (4) Engine mounts are too weak and permit too much engine movement. (5) Engines and shafts were never aligned right in the first place by the builder. This is more common than you might think. A General Rule The longer the shaft and the larger the diameter, the more critical proper alignment is. That's because larger shafts tend less toward self-centering than small ones because they're more rigid. Smaller boats with 1-1/4" and under shafts can tolerate quite a bit of misalignment so long as the shaft is not being bent around the hull opening flange. At 2" the system should be aligned within 1/16"; if that sounds like a lot, consider that that is 0.0625" which quite difficult to measure at a cutlass bearing. Its also very difficult to align a strut any closer than this. The real beauty of these systems is that the shaft will align itself as it wears into a new bearing, eliminating this meager 1/16" intolerance. Another aspect of this rule is that two bearing shafts require more exact alignment than single bearing shafts. This type of mount is one of the least effective types. Simply a threaded stud in a rubber doughnut, it allows 360 degree movement. Note also that the long stud can create a substantial lever if the engine is mounted up toward the top. Over time they sag substantially, throwing the engine our of alignment. It is supplied standard with Mercruiser and Caterpillar engines. This is what often happens with this type of mount. Note that its badly cocked to the left. When the engine is shifted, the mount allows it to move a full one inch. Not much point in bothering with alignment under these conditions. Weak Engine Mounts Top quality engine mounts are expensive, hence the motivation by the builder to use the cheapest mount possible. Weak engine mounts mean that your engines will never align properly because they constantly permit engine movement, so how can a shaft be aligned to a moving engine? The procedure for determining whether the engine mounts are holding the engines steady is very simple, it is called the Back Down Test. If the mounts are the vertical stud type set in rubber in an aluminum base, these are the kind that are prone to rocking back and forth, particularly with heavy diesel. Check the stud to make sure that its centered in the base with the vessel at rest. If its leaning in any direction, the mount is stressed and the system is out of alignment (see photos above ). Conduct a back down test. It takes two people to do this, one person operating and one observing the mounts and engine. Observe the point where the engine bracket attaches to the mount. One engine at a time, start from neutral, put the engine in gear and then accelerate hard, up to about 1/2 throttle for several seconds. Stop, then repeat this process in reverse, all the while watching the mounts for movement. Repeat several times. If the engine and mount are moving more than 1/8" in any direction, your mounts are not doing their job of holding the engine in place. While underway, another thing to check is the shaft runout at the stuffing box. Observe the shafts while running at two speeds, idle and cruise. Observation of shaft runout will only prove the negative; out of line shafts can appear to run true even though out of line (you are observing only one end of the shaft). On the other hand, a badly wobbling shaft means something's wrong. Runout up to 1/8" is acceptable on shafts 1-1/2" and under at idle speeds but not at cruise. If shaft wobble is visible at 1200 RPM and over, suspect a problem. Again, that's because rotating shafts tend toward self-centering. At high speed even bent bent shafts can straighten out and show no sign of trouble. Shafts 1-1/2" and over won't tolerate bending and can cause transmission damage. If the shaft is observably causing the transmission to move (oscillate), or you can feel the movement by putting your hand on it, then there's definitely a problem. A preferred style, the Ace mount permits very little engine movement. At the least, this type should be used for the rear engine mounts. The engine bracket should be as low on the stud as possible so as not to provide excessive leverage to the mount. This puny little mount on a diesel engine is totally inadequate and was responsible for transmission and shaft damage. With the boat out of the water, you can check the shaft alignment yourself by checking how the shaft aligns to the cutlass bearing. Needless to say, you can only do this with a bearing that is not worn. In anything but a brand new bearing, there is likely to be a gap at some point where the shaft meets the rubber. Inspect the bearing from the front and back, noting the size of the gap and where that gap is. If the strut is correctly aligned, the gap should be at the top at both ends. If the gap appears at opposite positions -- either side-to-side, or top-to-bottom -- the the strut is cocked and out of alignment. See the illustration below. The reason a slight gap appears at the top on a correctly aligned shaft is due to the weight of the shaft compressing the rubber. If that gap is excessive, and if the rubber at the bottom is badly compressed, then the bearing is either worn or the rubber is very weak. Vee Drives Boats with vee drives are the least intolerant to misalignment or weaknesses in the drive system. This is because the shafts are very short and reverse direction. Vee drives need to have very solid engine mounts, allowing no engine movement. Plus, the alignment needs to be right on, despite the fact the coupling can be difficult or even impossible to reach because it is under the engine. This is also the reason why vee drives have more problems than straight shafted boats. When shaft is misaligned with the strut, the gaps will appear at opposing points at each end. Testing for Bearing Wear This is very easy. Simply lift up on the end of the shaft as hard as you can. Use a long board as a lever if necessary. If the shaft moves up and down, its worn and is ready for replacement. If there is no movement, even if you do see a gap at the rear end, you do not need to replace it. Dial Indicating Shafts Recently a number of articles have appeared in boating publications about dial indicating shafts while in the boat. I'll explain why this should never be done. As noted above, boat hulls can and do change shape over time, particularly when it is hauled. Further, the shape of the hull changes when hauled versus afloat. The changing shape of the hull is likely to cause the shaft to bend. Now, you may look at a 1.5" stainless shaft and think that it's cannot be easily bent. In fact, if you suspend it on its ends, even gravity will bend it considerably. Gravity will bend a 15' shaft a lot. Therefore, aligning engines to the shaft must always be done with the boat afloat. Finally, when you rotate the shaft by pulling on the propeller, you're moving the shaft against the rubber bearing, further throwing your dial indicator readings off. As any trained machinist will tell you, there's only one way to dial a shaft and that is on a calibrated roller bed. One simply cannot dial a rotating object without a reference base and expect accurate results. And a shaft in a boat doesn't provide such a reference. Only after all the above checks have been made and proven that all else is in order, should one then proceed to use the feeler gauges on the coupling. The problem with using feeler gauges is that this measurement can give a false indication that all is well. Particularly smaller shafts can be out of alignment at one end and yet still give a favorable reading at the coupling end. This is because shafts with multiple bearings can bend it into a favorable position while overall it is still badly out of alignment. Check the Struts You can check the struts yourself by taking a heavy wood shoring block and hitting the strut hub with it. Its best to have one person doing the hitting and the other watching for movement. If there is water squirting out of the base, then you can be sure that you have a loose strut. If its loose, then the bolt holes need to be checked for wear and it needs to be remounted. Also note whether the hull bottom is deflecting when you hit the strut. If it is, you have a problem. Weak Struts This is a very common problem on small to midsize boats. If you want to understand just how important strong struts are, just take a look at the huge struts used on larger Bertrams, Hatteras or Viking yachts. They don't spend all that money on massive struts for no reason. When there are tens of thousands of dollars at stake in machinery, the drive support system must be strong. A further fact to consider is that the smaller and less the value of the boat is, the less the amount real engineering has gone into its design. The drive system is one area that is often shortchanged. Take a close look at the strut arm length to strut base ratio as shown below. In other words, the ratio of the base footprint to the strut length. Then look at the strut width and cross-sectional thickness. In the photograph at left, notice how long the strut arm is and how narrow the width is. The arm to width ratio is over 3:1 while the length to base ratio is more that 2:1. The extreme amount of leverage that the arm applies to the base means that it can't possibly hold the shaft steady. It will deflect and allow the shaft and propeller to oscillate. There's no way this long, thin strut is going to prevent the propeller from fluttering and causing vibration. The shaft is also too long and extends beyond the strut by 3". Distance between strut and prop hub should be no more than 50% of shaft diameter. Both these boats have the same size propeller. The strut on this Hatteras is three times larger with a mount base the same width as the strut length. The strut in photo at right carries the same size shaft and prop, both on a 40' boat. But the later is double the thickness in both width and cross-sectional area, with a substantially wider base. There is no doubt that this strut will hold the shaft steady. Also notice that the length of the strut bore is double the length of the other, which allows a much longer bearing that will wear more slowly. That large strut will hold the shaft very steady, and because of this, correct engine/shaft alignment is much more critical. That's because the bigger struts create a more rigid system. If its not correctly aligned, something will have to give, and whatever that is is likely to be expensive. The same holds true for shafts with double struts. In fact, a double set of struts will hold a shaft in even closer tolerance. As a general rule, shafts under 1.5" tend to be self-centering because they will bend so some small degree. But shafts larger than this do not take well to bending. They will not bend but work to tear the system apart if not correctly aligned. Weak struts that are fluttering while underway are one common cause of vibration problems that don't go away, no matter what you do. Keep in mind that the two propellers are pushing the entire weight of the boat and some beef is needed there to hold them steady. The one shown at left in the photo above is what a weak strut typically looks like. Of course the big strut costs a whole lot more than the skinny strut, and that's why some builders cut the corner on this critical component. There is no solution for this short of replacing the struts with stronger ones. Other Unsolvable Problems Now comes the bad news for folks that own boats that have chronic drive system problems. Chronic problems, such as frequent transmission failure, rapid bearing wear, vibration and stuffing boxes that continue to leak no matter how often you repack them, are usually related to structural hull weaknesses. There are a fairly large number of boats that have weak bottoms. A boat with a weak bottom usually translates to engines that are moving up and down because the bottom is doing the same. 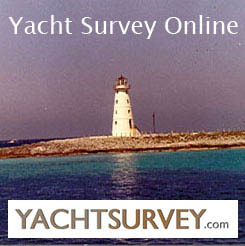 This can be checked by taking the boat on some rough water and measuring stringer deflection. This can usually be accomplished by using a rigid measuring device and placing it on top of the stringer and then gauging the amount of movement relative to the deck above. Don't be shocked when you see as much as 1/4" deflection, for this is common. But when the amount of deflection rises to a 1/2" or more, that's the amount that the moving engine is throwing the shaft out of alignment. And when its moving that much, its not hard to understand why transmissions break down, stuffing boxes leak and bearings wear out quickly. Short of a massive job of strengthening the stringers, the only thing to be done is to pass the boat onto someone else. As you can see, inspecting your drive system takes a bit of time, but is simple enough for just about anyone to do. The next time you have a vibration problem, before you automatically go sending the props off to the prop shop, or call for an engine alignment, check out the entire system so you don't end up missing the source of the problem and fixing what doesn't need to be fixed.